I think I always wanted to do what I started only in my 40s: wander around with a camera and photograph whatever interests me. It was 1985 and I was about to graduate high school. My life had been about strict routines, and I was excited that they would soon end and my life would be much more mine to create. I felt a desire to document the waning days of my soon-ending life, so I dug out a camera and loaded it with film. I’ll bet I owned more than 100 cameras then. I’d already been collecting for upwards of ten years. But which camera I chose for this roll is lost in the mists of my memory. The negatives attest that it was a 35mm camera. I’m trying to remember what decent 35mm cameras I owned then. The only one I remember is my Argus A-Four. I wanted very much to photograph the downtown of my hometown, South Bend. I rode the city bus downtown, just me and my camera. I made just one photograph, this one — and my self-consciousness overcame me and I got right back on the bus and went home. I feel compassion for my then-self now. I wish I could step back and give that fellow a shot of confidence that the things that interested him were perfectly okay, and to hell with what anybody else might think about it. And then I would have told him to keep shooting that day, as downtown South Bend would change dramatically over the next 30-plus years and it would be great to have a record of how it was. 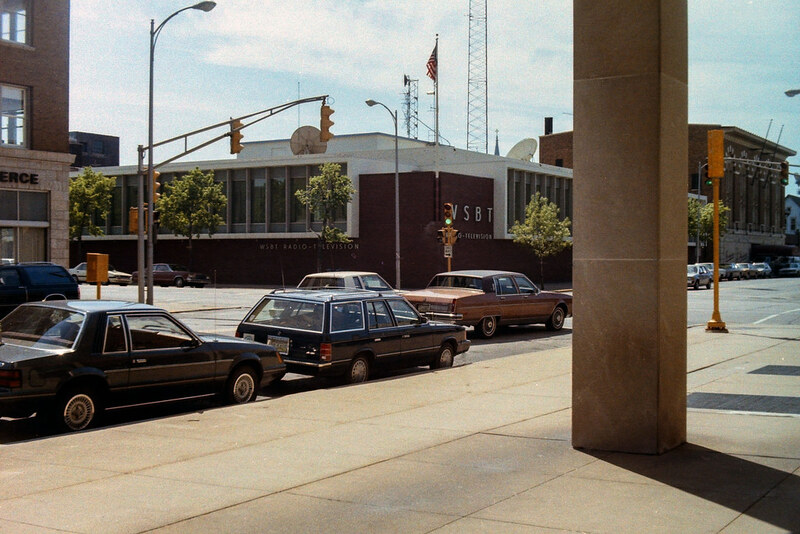 The pictured WSBT building is a great example. WSBT moved out some years ago and the building has been so extensively remodeled it’s hard to recognize it. Most of the rest of this roll is of mundane subjects and a few photographs of my classmates at the Senior Picnic. But I did make a few more photographs that showed the world I lived in, and I treasure them. 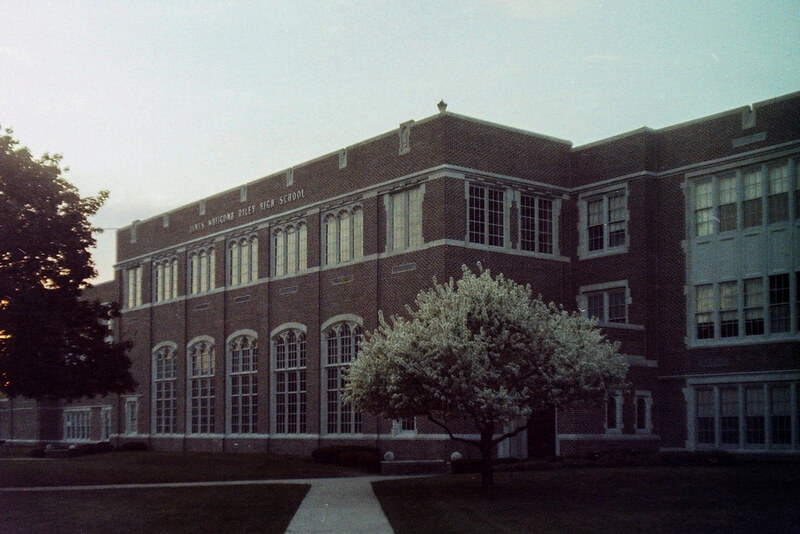 This is the high school I went to. 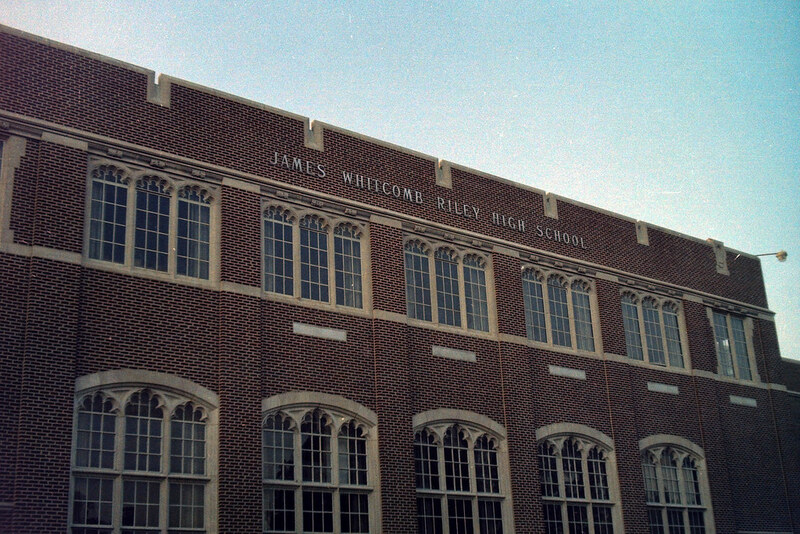 The building is no more, demolished after some years of neglect, replaced by a gleaming modern school a block away. I got to tour the building just before it was torn down and it had fallen into sorry, sad condition. I felt bad for the students who had to use it. I climbed the oak tree in our back yard to make this photograph. We lived on a corner; this is the side street. 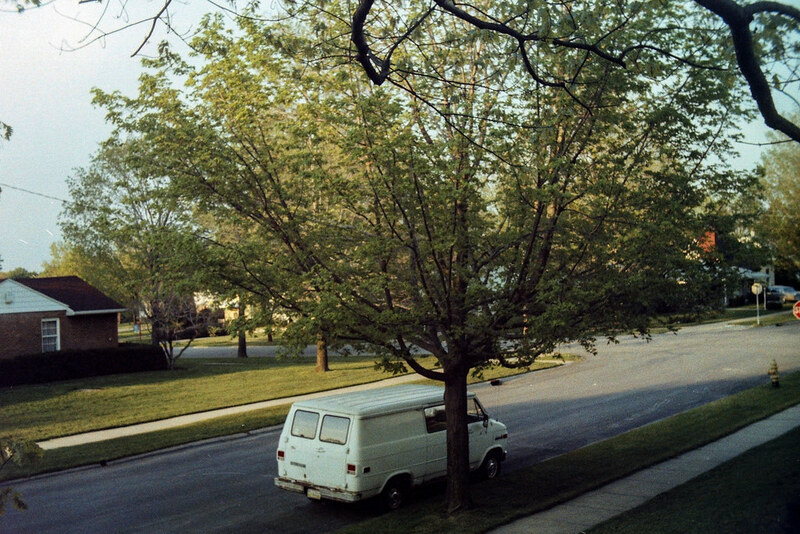 That’s Dad’s work van, which we affectionately called The Iron Maiden. Read its story here. My subject was this fire hydrant in our yard. It had recently replaced one that had been painted to look like a Minuteman. Most fire hydrants around the city had been so painted in 1975-76 in honor of the Bicentennial. Fortunately, I did not know yet to fill the frame with my subject, and so I got a pretty good photo looking down the street I grew up on. It was a good place to grow up. Have a look at some more recent photos from this street here. I scanned these negatives a few years ago with my Wolverine Super F2D scanner (review here). The flatbed I own now would do a much better job, but these are good enough. It’s nice to be the age we are now because we can choose to spend our money on the things that interest us! I used mailed ordered processing . It was about 3.00. I couldn’t wait for the mailman to put my photos in the mailbox, I’d look out the window waiting for his arrival. It’s so nice to reminisce about the old camera days. I’ll read your other post. I did that too, in the 80s. Clark Color Labs would process and print a roll of film for about $4 plus postage, as I recall. It’s the only way I could afford to shoot any film, as drugstore processing cost about twice that. However, the drugstore prints have retained their color, where the Clark prints are all washed out now! You get what you pay for. Fortunately, I still have all the negatives and could make new prints if I wanted! That’s the name! I couldn’t remember it. 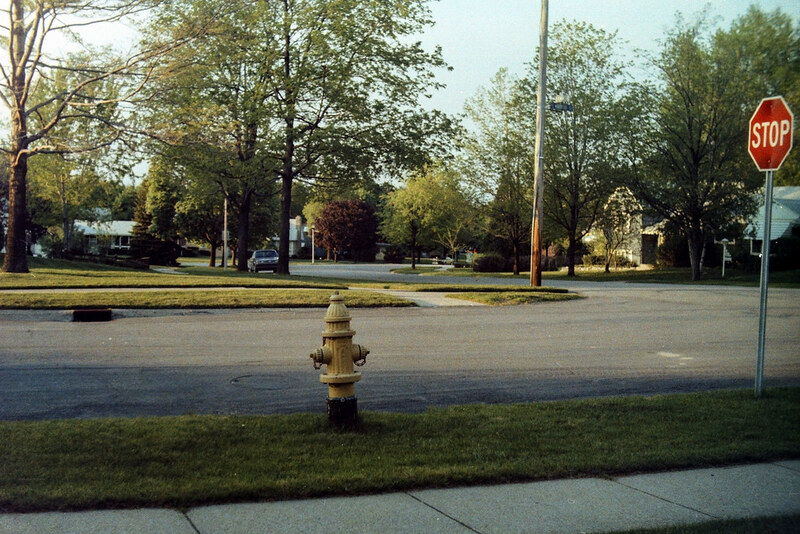 In maybe 1967 when I was about 8 I took 2 or 3 shots of scenes from the streets of Fort Wayne from my dad’s car. When they got developed my mom berated me for wasting expensive film on them. I hope I find the box there they’re stored some day as I would love to see them now. It’s crazy, but it’s those random photos of places that we value most today because things change so much. I wanted to make more photographs as a boy but money just wasn’t there for it. I shot maybe a half dozen rolls through my old cameras as a teenager. I shot way too much 126 film in a truly terrible camera as a kid simply because 126 film and processing was the least expensive. We all knew the cars were square, but we all thought we were pretty cool! So very cool that you still have these photographs. I saved most of my 35mm negatives and quite a few 8×10 black and white prints I made in the basement darkroom I had as a teenager in the 70s. Had them all well into the late 90s until the ex tossed them out during our divorce. There was nothing spectacular there, just pictures of stuff I found interesting as a kid. It would be wonderful to go through all of them now. I don’t remember exactly how my negatives and prints survived my divorce, given how little else did. I know that there was a period where my soon-to-be-ex was in paramedic school and needed me to stay with the boys and put them to bed. I quietly removed a number of things from the house then. And after the divorce was final, one rainy evening she put the portion of the stuff awarded me, that she actually thought I should have, on the front lawn and told me to come get it. Whichever way it was, I’m super happy to have it now. I got the bug when I was 6 years old in 1960. Still have my first camera which was a basic box camera made by Imperial. I got it for selling boxes of Christmas cards which was a common thing back then. Did learn I don’t like selling Christmas cards or chocolate bars. Still have all those photos stored in a box in the bedroom. Things took a bit of a leap forward when I went to a public school for 8th grade after moving to the San Fernando Valley from Baltimore. Had to take an elective and so I took Graphic Arts. Yeah, I learned to make paper, to set type and print but it was the darkroom that caught my attention. You could only get in it if you finished all other requirements which I did in record time. The darkroom was all mine for seven weeks where I learned developing film, to print work, and to making my own pinhole cameras. Later, as a junior in college I had spare time to take a class out of my major and so I took photo journalism for one year with use of a darkroom. Then my mother had a darkroom put into their new house in the Bay Area. Had use of that from 1973-2006. My biggest problem today is… time. I remember selling Christmas cards for money. I tried it once. Hated it. Much preferred shoveling snow and mowing lawns – felt like honest work. You’re fortunate to have had that access to darkrooms! I did in college but those were fallow years in my photography. Great to have a photographic record of buildings/neighborhoods that have disappeared or changed drastically. I wish I could say I was nostalgic for this era, but the truth is…I wasn’t alive when these pictures were taken! I’ve been documenting the built environment on old Indiana highways for more than a decade now — and I’m starting to really record changes over time. It’s cool, and will probably be valuable one day as a historic record. Wish I’d started 30 years ago. What a great post Jim – and some wonderful shots from your younger self. This is a brilliant example of what to mind mind is the greatest power of photography – its power to document. I like a nice arty shot as much as anyone, but its the ability to record our lives and the world around us that holds the most appeal for me. I view each frame as a little mini window into time. Although I’ve always loved cameras and taking pictures – I had to beg borrow and steal other peoples cameras until I actually bought my first in the late 90s. I do wish I had the shots I’d taken in the 80’s and 90’s though – alas everything was lost when my parents divorced and I moved out. Stuart, I only wish I had shot 20 more rolls of everyday scenes back then. Man, to have photos of Miami Village, where all the neat little shops used to be, or of downtown. I’m fortunate I suppose that my old photos survived moving out of my parents’ and also my divorce. What a neat glimpse back in time – for you and for us! :) I wish I would have taken more pictures when I was younger. I imagine many of us feel that way. What a window into our younger world it would be! Jim, as a kid coming into his own in the 1980’s I’d say those were the best of times. But just like any decade, you can’t tell how far back it was until you see the pics. The cars in your pics look so old and dated! Great post and pics! zOMG the cars! I forgot just how square the cars were!